The Care Quality Commission (CQC) has rated Manchester University NHS Foundation Trust (MFT) Good following the organisation’s first inspection since becoming a newly established NHS Trust in October 2017, with two of its specialist hospitals and Critical Care and CAMHS services receiving an overall rating of Outstanding. MFT was visited by more than 120 CQC inspectors over a six week period in autumn 2018 in what was the largest comprehensive inspection ever carried out in the NHS by the CQC. In their report released today (Tuesday 19th March), health regulator, the CQC, has rated MFT Good with a significant number of Outstanding features. Two MFT hospitals have been rated Outstanding – the Manchester Royal Eye Hospital and the University Dental Hospital of Manchester. Manchester Royal Eye Hospital is the only Eye Hospital in the UK to receive an Outstanding rating. Child and Adolescent Mental Health Services have been rated Outstanding as has Critical Care. There were also 24 individual indicators rated Outstanding for individual key lines of enquiry across the Group of hospitals. Chief Executive of Manchester University NHS Foundation Trust, Sir Michael Deegan said: “As the largest NHS Trust in the country and a leading provider of specialist healthcare services, this Good rating provides our patients with significant assurance about the quality of care they can expect to receive from MFT, whether that is in one of our hospitals, the community or in their home. Six MFT hospitals were rated Good. 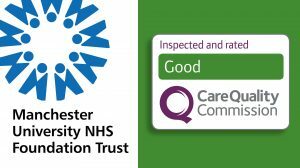 The Manchester Local Care Organisation, which provides comprehensive community services across the City of Manchester and was formed in April 2018, was also rated Good. The CQC follows five key lines of enquiry (the way in which they measure services) which are Caring, Safe, Effective, Responsive and Well-led. Caring was rated Outstanding with the other four rated Good. As with any inspection, the CQC identified a number of areas where MFT needs to make improvements and the Trust will be focussing on these in the coming months ahead.